The Houston Astros’ players are easy to love. Their front office is not. The Houston Astros’ players are easy to love. Their front office is not. Should we care? 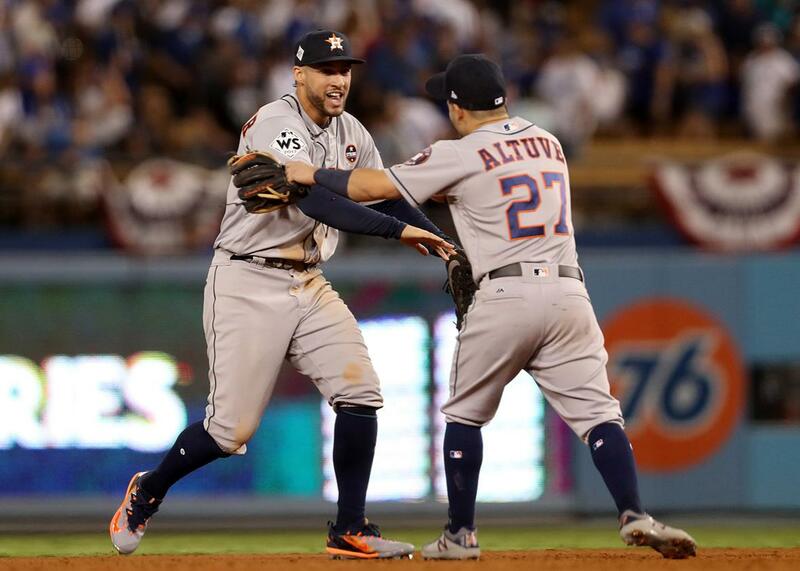 George Springer and Jose Altuve of the Houston Astros celebrate defeating the Los Angeles Dodgers in Game 2 of the World Series on Wednesday in Los Angeles. Branch Rickey once said that luck is the residue of hard work and design. Houston Astros General Manager Jeff Luhnow has taken that maxim one step further: He has a plan and the breaks have gone his way. The decisive moment of Game 2 of the World Series, which the Astros won 7–6 in 11 innings, might have come in the bottom of the 10th. That’s when Chris Devenski’s errant pickoff throw deflected off umpire Laz Díaz, keeping the potential game-winning run from reaching third base. “Laz was perfectly positioned, right where we wanted him,” explained Astros Manager A.J. Hinch. While all the design in the world won’t provide for that kind of lucky bounce, the Astros wouldn’t have even made it to the 10th without the timely hitting of Carlos Correa and Marwin Gonzalez, and they wouldn’t have won the game without a home run from George Springer in the top of the 11th. And consider Alex Bregman, the star of Game 1, albeit in a losing effort. On a night when Clayton Kershaw was nigh unhittable in leading Los Angeles to a 3–1 win, Bregman supplied the foregoing qualifier by hitting a fourth-inning home run. Bregman, a capable shortstop playing third base because he’s blocked by Correa, was the No. 2 overall pick in the 2015 amateur draft. Houston wasn’t the second-worst team in baseball in 2014—the Astros’ 70–92 record entitled them to the No. 5 pick—but the team drafted in that spot as compensation for failing to sign its 2013 first rounder, pitcher Brady Aiken. The Astros had tabbed Aiken with the No. 1 pick, passing over valuable future major leaguers like Carlos Rodon, Kyle Schwarber, Aaron Nola, and Michael Conforto. The parties reportedly had an agreement in principle, but then the Astros got a bad medical report on the high schooler’s arm and reduced their offer to the minimum allowable amount. They also made an offer to their fifth-rounder, high school right-hander Jacob Nix, that was contingent on whatever Aiken chose to do. While the Astros did eventually ratchet their offer to Aiken back up, his agent Casey Close, who also worked with Nix, believed them to be acting in bad faith, and Aiken did not sign. The Astros’ reward for this maneuver: a draft pick that turned into a franchise cornerstone. In one sense, the Astros are just another front office with an analytics department, trying to add some certainty to the soft elements of baseball decision-making. Some of the Astros’ actions are straight out of the traditional front-office playbook: Teams have always played hardball with draft picks and with young players who aren’t yet eligible for arbitration or free agency, as the Astros did when they unilaterally renewed Correa’s contract at the league minimum this past spring. They also followed what is now standard operating procedure in demoting Springer in 2014 following his rejection of a long-term contract; the Cubs manipulated Kris Bryant’s service-time clock the same way. Conversely, no team has played Russian roulette with its draft picks quite the way the Astros have, and none has cut its scouting staff to the same extent. Under Luhnow, Houston’s front office is populated by brilliant baseball advisers and analysts. (Disclosure: The general manager’s office and the analytics office both employ former colleagues of mine.) The team is also young and scrappy, featuring exciting players like Bregman, Correa, Springer, and José Altuve. Yet there can also be something cold about the Astros’ devotion to rationalism. Houston forces us to ask ourselves what we want from a baseball team: touchy-feely sentimentality or bloodthirstiness. When a team hasn’t won a World Series in 55 years, it’s probably presumptuous to expect anything but the latter. Sure, but just because they said what they were going to do doesn’t mean it had to happen that way. Consider how the team was put together. International signee Altuve and future ace Dallas Keuchel—a seventh-round pick in the 2009 draft—were both in the fold before Luhnow took over. Gonzalez, a utilityman extraordinaire, was acquired via trade on the day Luhnow was hired. At the same time, the club’s lowest-of-the-low finishes put the Astros in strong drafting position. Picking first overall in 2012, Houston tabbed superstar shortstop Correa, then added pitcher Lance McCullers Jr. in the supplemental phase of the first round. The first overall pick of the 2013 draft brought pitcher Mark Appel, who looks like a bust. If he is, though, that won’t be Luhnow’s problem—he traded Appel and four other players to the Philadelphia Phillies for closer Ken Giles in December 2015. After that came the business with Aiken that resulted in Bregman, and even if you dislike the process that procured that pick, you have to concede the Astros chose well. The draft makes no guarantees. Springer, the final first-round pick of the old regime (selected 11th overall in 2011), was tabbed between Cory Spangenberg and Taylor Jungmann, neither of whom has seen anything close to major league glory. It takes no great stretch of the imagination, then, to posit an alternative reality in which the Astros endured a Kansas City Royals­–like 30 years of wandering the Sinai of the Second Division. During the long exile that preceded that team’s 2014 World Series loss, the Royals lost 100 or more games four times, and in this millennium alone had 12 top 10 picks. Sometimes they made good choices, calling Zack Greinke’s name with the sixth pick in 2002 or selecting Alex Gordon with the No. 2 selection in 2005. They’ve had just as many clean misses, picking the likes of Colt Griffin and Bubba Starling. The Astros have made two unmitigated mistakes during Luhnow’s tenure, handing a long-term contract to first-base bust Jon Singleton and giving up on outfielder J.D. Martinez, who has since reinvented his swing and is now an offensive force. This aside, the Astros GM seems to have a perpetually renewable get-out-of-jail-free card. The sheer unlikelihood of the team’s accumulated good fortune—getting rewarded for mistakes like Appel and Aiken; hitting on Springer, Correa, and Bregman; finding a highly valuable player in Gonzalez; Altuve turning into a likely Hall of Famer; Keuchel making the Tom Glavine–like transformation from a 5.00-ERA punching bag to a Cy Young Award winner—argues that luck has played an outsize role in the team’s success. An economics and engineering major at the University of Pennsylvania, Luhnow could have spent his life as a management consultant (a career he pursued for five years) but ended up in player development instead. Two years ago, Ken Rosenthal characterized him as “a baseball outsider who rankled co-workers with his distinctive ideas and sometimes questionable people skills,” someone who “frequently drives people to distraction” and “often elicits animosity in traditional baseball circles.” The dangers of Luhnow derangement syndrome can be seen most clearly in St. Louis. After Luhnow came to Houston from St. Louis in December 2011, Cardinals scouting director Chris Correa broke into the Astros’ player information database, a crime that led him to be sentenced to 46 months in prison. Even if Luhnow can be caustic, he shouldn’t be condemned for operating within a system he did nothing to create. The Astros were tough with Aiken, but they also were doing what they needed to do to protect the flow of talent to the organization. Similarly, they’d be foolish not to control the salaries of players like Altuve, Springer, and Correa—it’s not Houston’s fault that the economics Major League Baseball are stacked against young star players. And the team’s paring of its scouting staff, while perhaps a bit coldhearted, was prompted by a belief that the grizzled road warrior with a radar gun in his hand and a cigar clenched between his teeth has become an anachronism. Ask your friendly neighborhood management consultant: Business isn’t nice, and modernization has a tendency to leave people behind. Maybe Luhnow isn’t lovable, but he’s built a team that’s hard not to embrace. The Astros’ luck could run out this season and in the years ahead. But for now at least, Houston’s general manager has put his franchise in a position to succeed. You can question the process, but it’s hard to quibble with the results.